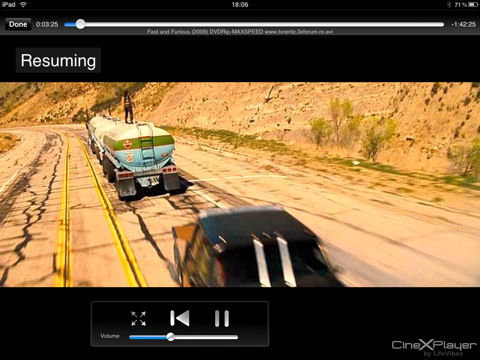 CineXPlayer for iPad is a free app from NXP Software B.V. that lets you import and watch your Xvid avi movies on your iPad without the need for conversion. Since the native iPad OS has no support for videos encoded with the Xvid codecs, until now you would have had to convert your Xvid files to a supported format like MP4 and sync them through iTunes to your iPad. CineXPlayer simplifies the process. You import the video files and play them in the app. The app has simple manage features like swipe to delete and the ability to stop/start videos with resume functionality. Importing your avi files into CineXPlayer is integrated right into iTunes. You just open iTunes and from the iPad connection under Devices, you’ll see CineXPlayer listed in the File Sharing section. Click on the Apps tab. Click on CineXPlayer and you’ll see a Documents pane where you can add any new .avi file you want to sync with your iPad. Notes: The app is free which is wonderful, though there is a small CineXPlayer logo in the bottom right side of the screen the entire time you’re watching movies. Perhaps a paid version without the logo could be on the way? You can play avi files though no support for RealMedia (.rm) or Flash (.flv) files is included and mkv AC3 formats are not supported as of now. AppSafari review of CineXPlayer Xvid was written by Joe Seifi on August 9th, 2010 and categorized under App Store, Featured, Files, iPad apps, Movies. Page viewed 7788 times, 2 so far today. Need help on using these apps? Please read the Help Page. You will find a step by step guide on how to convert and import AVI files to iTunes. Then it is just easy to watch AVI movies on iTunes or sync AVI video to iPad, iPad 2, iPad 3, iPhone 4S, iPhone 4, iPhone 3GS, iPhone 3G, iPod, iPod Touch, Apple TV and more. It even helps to convert and import 1080p AVI to iTunes for play 1080p AVI on the new iPad 3 or the new 1080p Apple TV 3.